The Okinawa Association of America (OAA)’s Annual Picnic has been a tradition for our members since its first inception in the 1930′s. 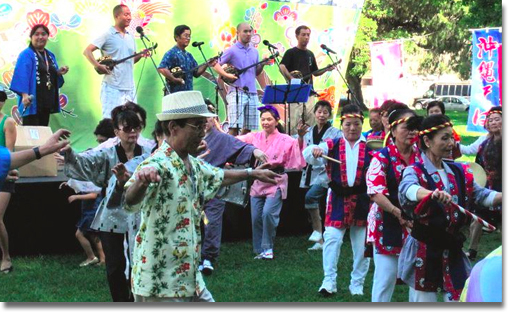 In addition to delicious bento, cultural performances, high school scholarship awards, raffle drawings, and family games, we host the only Okinawa-style bon odori in Los Angeles! We invite all audience members — regardless of age and experience — to dance with us! To help you prepare, we’ve produced some practice videos for the songs that will be danced at the Picnic. All of the songs are very repetitive and will be led by experienced dancers in the inner circle, so just follow along and have fun! Practice Schedule: For those who want in-person instruction, please join us at the OAA Center for our bon odori practices (schedule varies year-to-year). Click here to watch a video clip from one of last year’s practices! Please call the OAA at 310-532-1929 for more information. Background: 5 of the 6 bon dances are mainly based on the Hawaii-style choreographies from the Young Okinawans of Hawaii (YOH), with minor changes. The choreography for “Asadoya Yunta” was created by Yoshino Majikina, which was adopted by the Southern District Obon Odori (Buddhist Council) in 2001. Click here to watch an interview with the OAA’s bon dance instructor, Naomi Endow! PLEASE NOTE that bon dances are done with circles of dancers with a continuous forward motion. Click here to watch all of the videos back-to-back.